The proper restaurant where you sit down for four hours with your ten friends or colleagues or family. The Lebanese “fast-food” restaurant that is small and quick. In the second category, one of the fastest growing restaurants is Comptoir Libanais, which you can find in South Kensington, Sloane Street and around Oxford Circus. It is usually really packed every single evening of the week on Exhibition Road. But if you fancy some Lebanese food, is Comptoir Libanais really worth visiting? Comptoir Libanais catches the eye with its bright colours, its oriental tiles, its massive portrait of a Lebanese girl, the Lebanese products decorating the restaurant from the Tahine, chewing-gum (Chicklets) to the Baklawas and the beach bags..
Comptoir Libanais looks authentic and seems to be the perfect mixture between modern and traditional Lebanese. Perfect??? Wait. Not really. I’m sure every Lebanese person will tell you you can’t serve homous in a tiny little pot like that…Homous is made to be shared, but not at Comptoir Libanais. Comptoir Libanais (almost) got it in terms of Lebanese architecture, but got it all wrong in terms of Lebanese generosity…Portions are too small. Especially the meza (dips and salads) which are meant to be shared….The plates are not big enough. The restaurant wanted to be original by avoiding traditional Lebanese plates to share the food. That’s fair enough, but they could have definitely used larger modern plates and larger portions. But maybe if the food portions are small, that means that the food is tastier? No. The food is not great. Firstly, it is not fresh. The homous is too salty and seems to come straight from Waitrose or Tesco, with lots of added, poor quality oil. They give you two pieces of hard Lebanese bread (or pitta bread!!) to dip in the homous. The bread is not fresh, and doesn’t save the day. The salads are a failure too. Fattoush is a typical Lebanese salad that includes lettuce, tomatoes, cucumbers, onions, Sumac spice, red radish and lots more…In Comptoir Libanais, Fattoush is a salad I could have made home, that tastes nothing like Fattoush, has in total two tiny little pieces of tomatoes and no Sumac. Basically a lettuce salad with occasionally one piece of tomato or radish here and there. Disappointing. Quantities are small. Quality is average at best. Not a good value for money. Lebanese food, particularly Meza (a collection of dips and salads) requires enough space to put lots of dishes on the tables…But the tables are too small in Comptoir Libanais. They are stuck to each other. So you usually have no privacy in your conversations. The chairs are not very comfortable, probably to make you leave quickly. The waitress/waiters are polite. But some of them have no clue about what they are serving. I asked for a Mankouche (a dough topped with thyme and olive oil) which is the most typical Lebanese thing you could eat in the streets of Beirut. The waiters looked at me dazzled and surprised, although it was on the menu. I had to show them what I meant straight from the menu because they had no idea what a Mankoushe looks like, tastes like and how it should be pronounced. 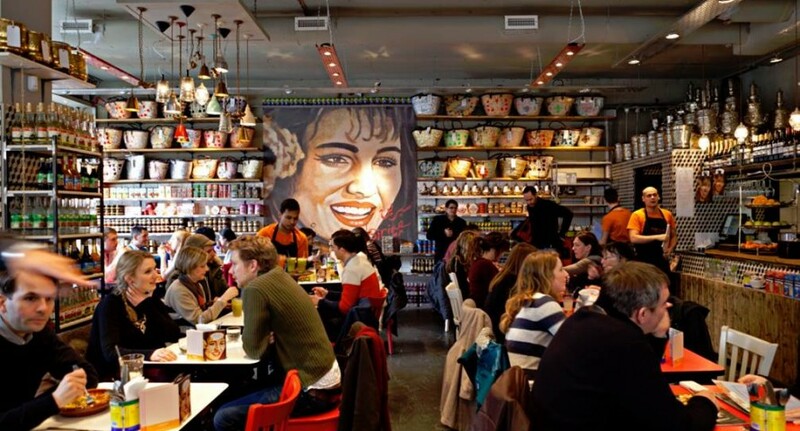 Comptoir Libanais invests more money on the restaurant appearance (and on their website) rather than on the food and service itself. It’s a shame, because it could have been the best Lebanese restaurants in London ever, based on its cool architecture. But it is not. Try any of the reliable Maroush restaurants (Randa, Beirut Express), Noura, Al Dar, ect. You might not find the cool trendy design of Comptoir but you will find tastier food and a more comfortable, relaxed, welcoming environment.